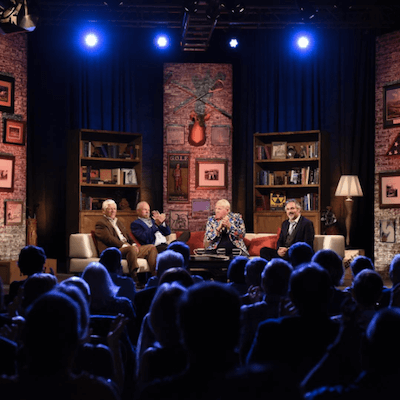 Feherty and the Golf Channel Turn 100! Life is about really cool experiences, visiting unique places and meeting amazing people. Recently, we were able to be a part of a very special event with the Golf Channel and do all three. The 100th episode of Feherty! Pro-golfer turned TV personality, David Feherty has brought new flavor to the Golf Channel through his series. The setting for episode 100 – the Greenbrier Hotel in West Virginia. Our Charlotte, Cleveland, and Columbia staff Go To Team crews joined the team for this live-to-tape episode in front of a live audience. The ever energetic host sat down with Lee Trevino, Gary McCord and John Daly while receiving personal messages congratulating him on his 100th. This included Presidents George W. Bush and Donald Trump. Golf’s best; Jordan Spieth, Martin Kaymer, Lee Janzen and Padraig Harrington along with baseball standouts Jon Lester, Tom Glavine, John Smoltz, Kevin Millar, and entertainment stars Rob Riggle and Larry the Cable Guy.